This post is sponsored by Mattel. All photos and text in this post are copyrighted to Soiree Event Design and may NOT be copied from this site and used in any way without permission from the owner. Pinning images, of course, is allowed and encouraged. Hey party peeps! 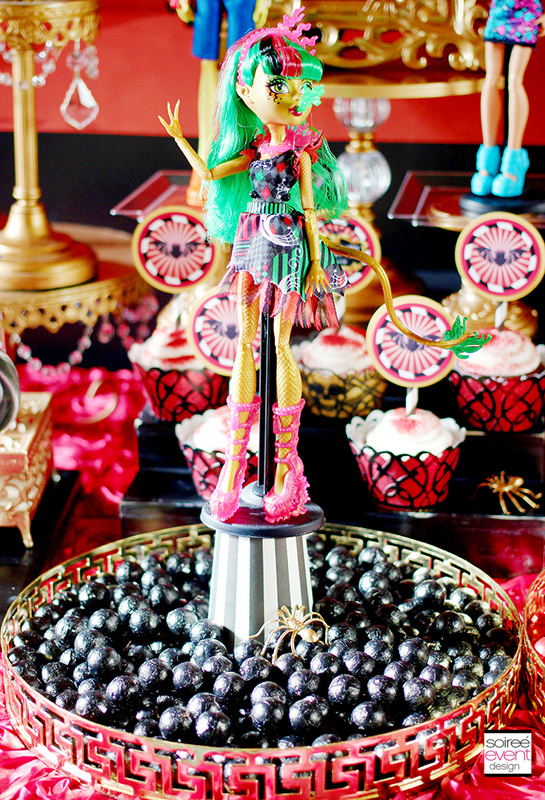 I’m so excited to bring you my latest party guide showing you how to host a Monster High Freak du Chic Party starring Monster High’s newest ghoulfriend….Gooliope Jellington! 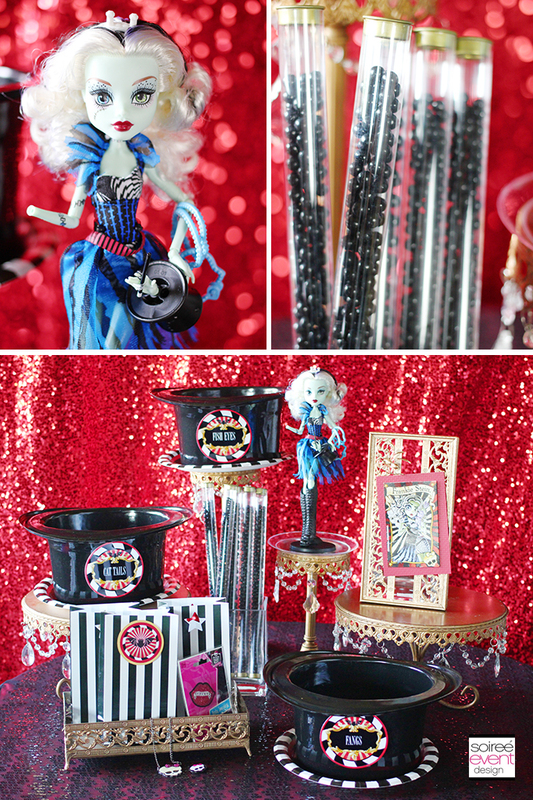 Monster High fans will love this freaky twist on a traditional circus party theme — FREAK DU CHIC— that is sure to be a hit this year on the party scene! 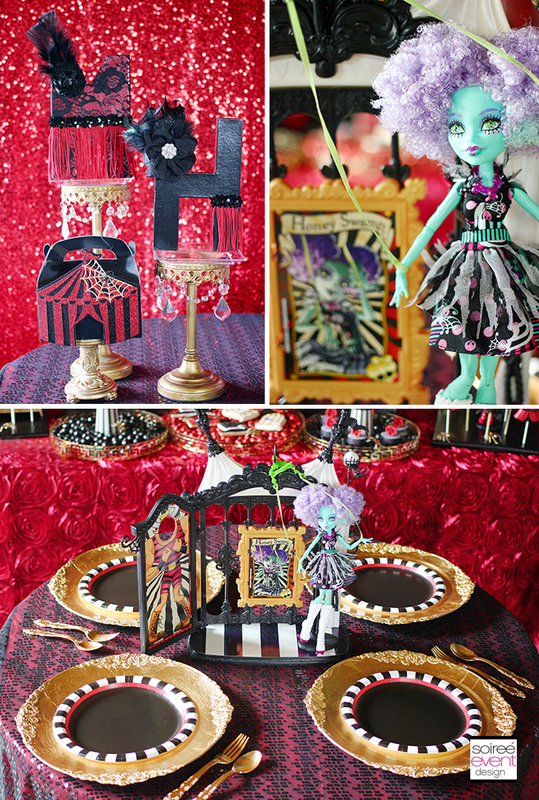 Be sure to scroll down to the end of the post to enter the HUGE MONSTER HIGH FREAK DU CHIC PARTY PACK GIVEAWAY to get you going on planning your own party including all of the Freak du Chic dolls – Gooliope Jellington®, Frankie Stein®, Honey Swamp®, Jinafire Long® and Toralei®, the Circus Scaregrounds™ Playset including Rochelle Goyle®, all 4 Ghoul Fair® dolls – Heath Burns®, Howleen Wolf®, Ellisabat® and Scarah Screams® PLUS…lots of party goodies you see in this post! 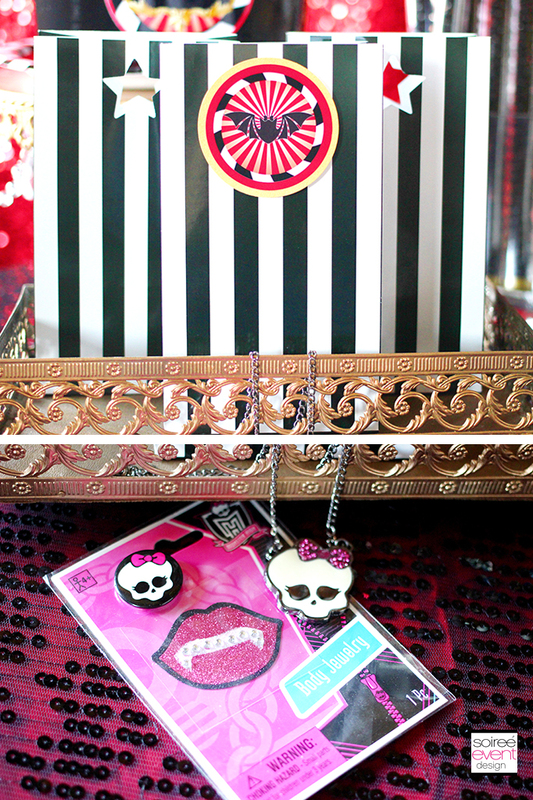 AMAZING GIVEAWAY FOR MONSTER HIGH FANS! 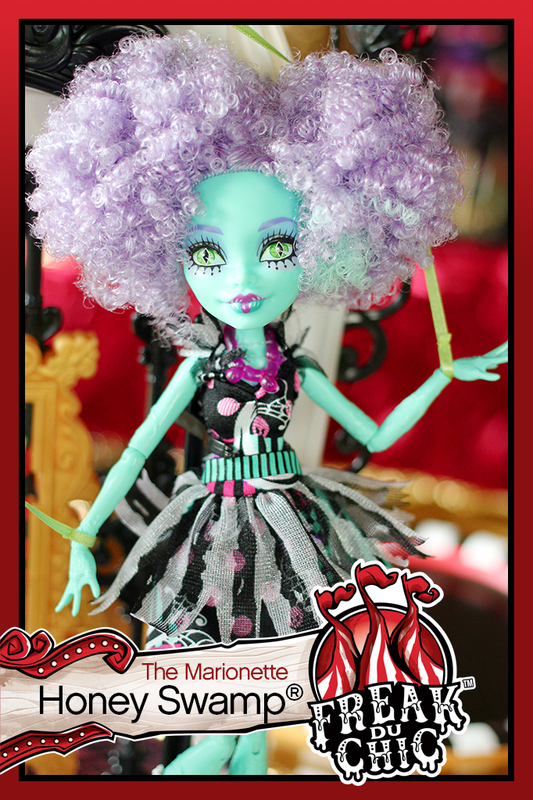 Introducing Monster High’s newest ghoulfriend — GOOLIOPE JELLINGTON! 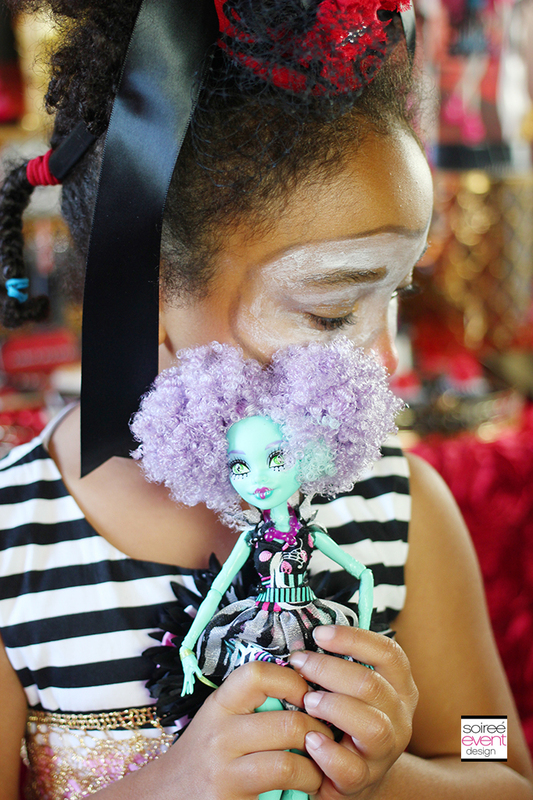 Gooliope Jellington is the BIGGEST ghoul to come to Monster High…literally! (she stands over 17″ tall). Her debut is just in time to help Frankie and the ghouls save the art programs they all love so much from being cancelled at Monster High. Gooliope is the ultimate ringmaster of the freakiest circus… “Freak du Chic” …a festival of freaky flaws with Magic, Mimes, Marionettes, Tight Rope Walkers, Fire Breathers and more! 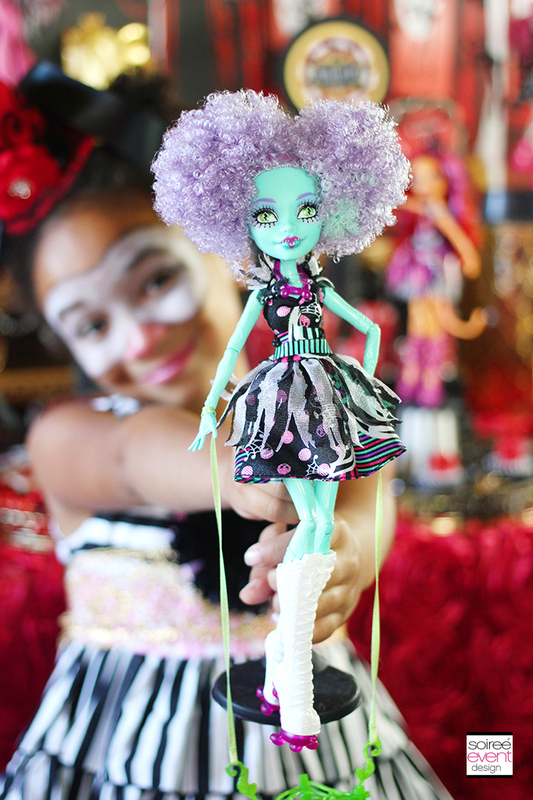 In a series of Monster High webisodes, Gooliope shows Frankie Stein, Honey Swamp, Jinafire Long, Toralei and Rochelle Goyle how to use their freaky flaws to put on the most freak-tacular circus fundraiser to raise money to save the art programs! 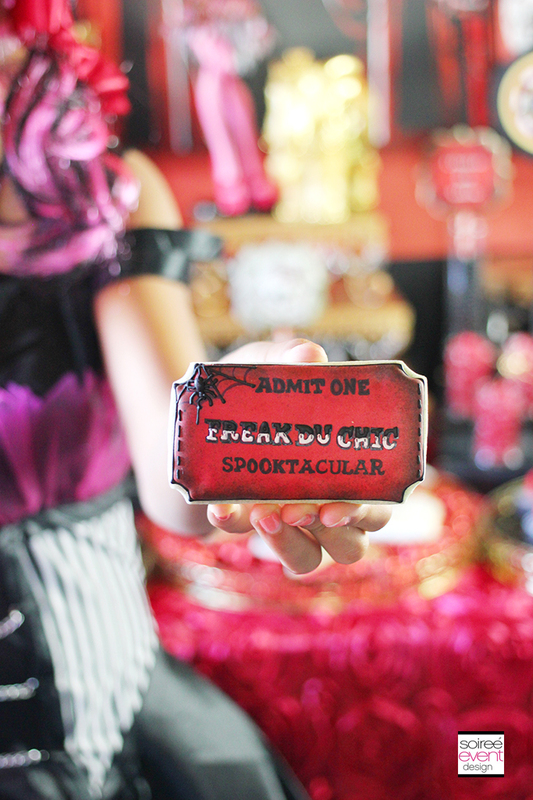 Celebrate with your own ghoulfriends by throwing your own Freak du Chic Circus party! Before I do anything, I watched the webisodes. My daughter, Riley, of course already knew the entire story as she had already watched them SEVERAL times! Watching the webisodes will give you a good idea on what the party should look like and even a few ideas of cool activities for the kids to do. 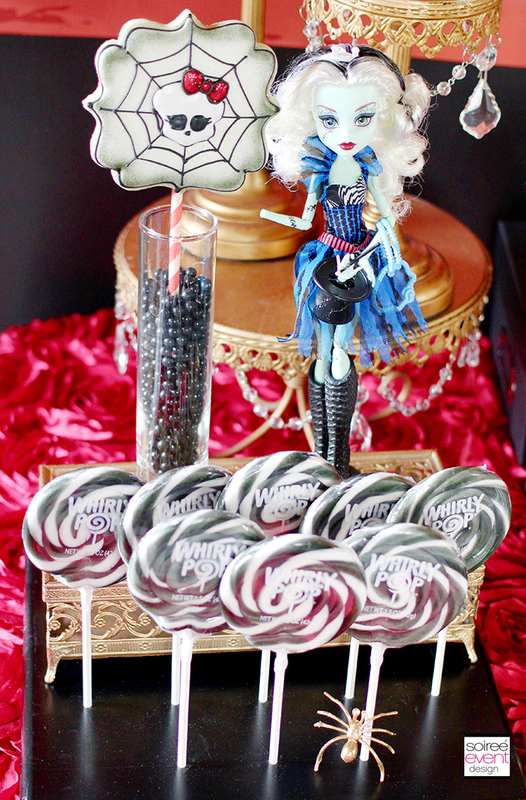 Whenever I get the chance to style a Monster High party, the first thing my daughters love to do is plan their outfits! This was no different…they stayed in their rooms for hours putting together their Freak Du Chic looks. I for one think they are adorable and did a great job! 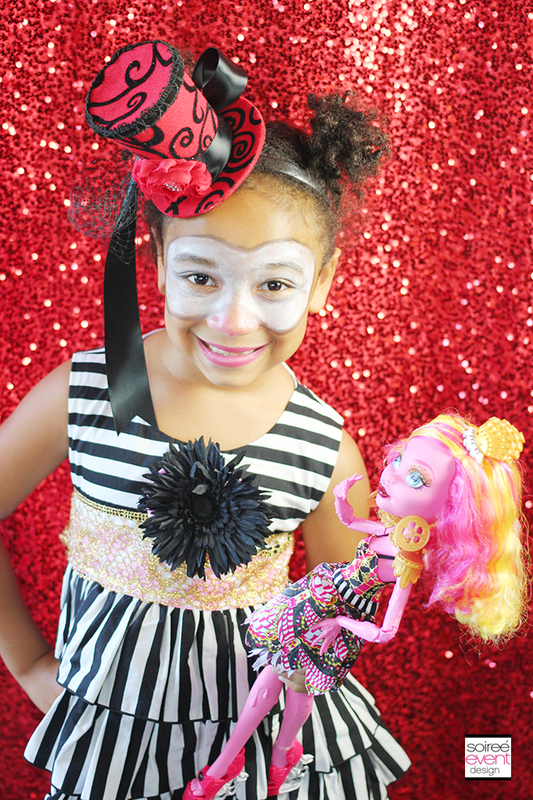 Faith wanted to resemble her favorite doll, Rochelle Goyle and Riley…well, she loves them all, so she decided to do her own thing and dress up like a clown….a fashionable clown of course! (I mean, check out that amazing top hat headband). 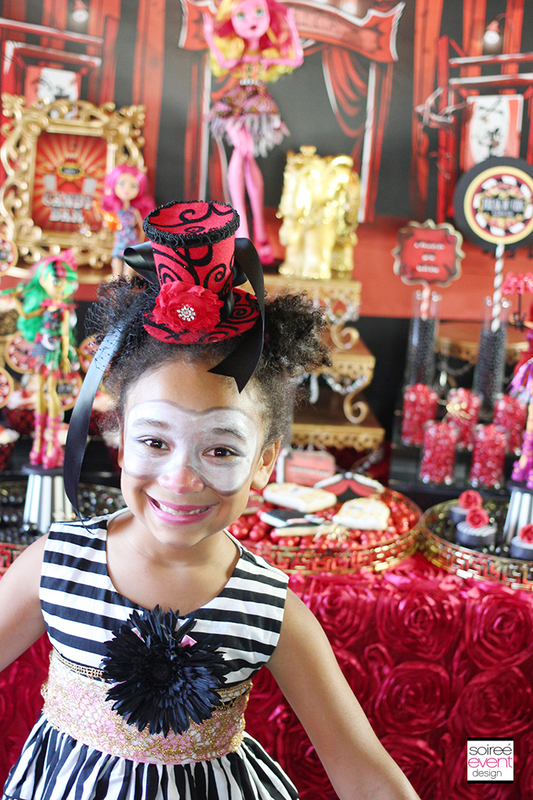 Now that we’ve gotten the rundown on the girls’ Freaky Fab fashion, now let’s talk Mommy’s specialty….DECOR! 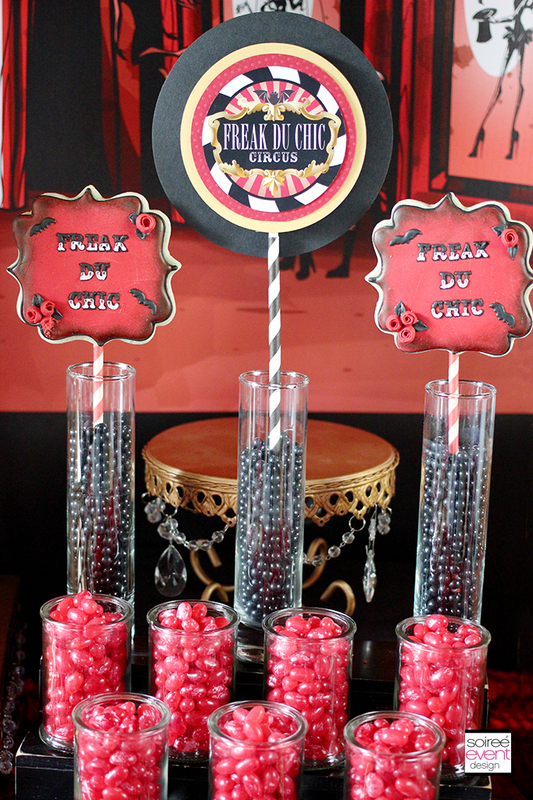 SET THE SCENE — FREAK DU CHIC! 2. 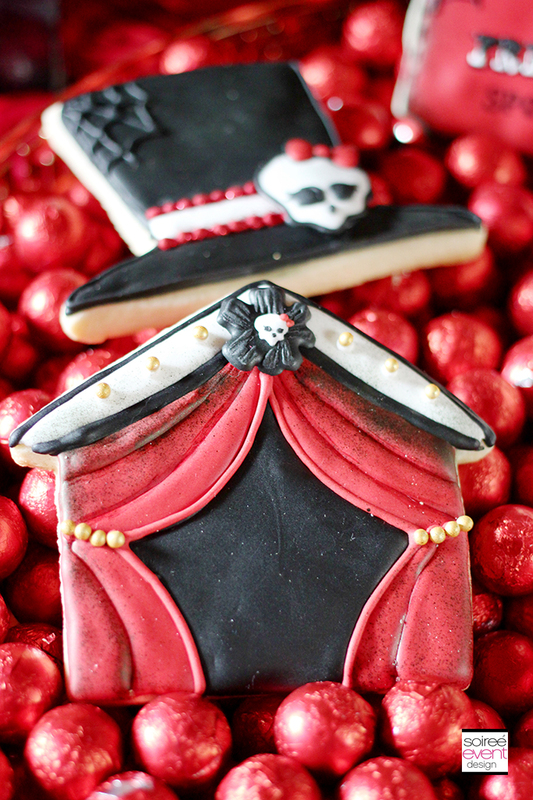 Order custom desserts that match the party’s theme! 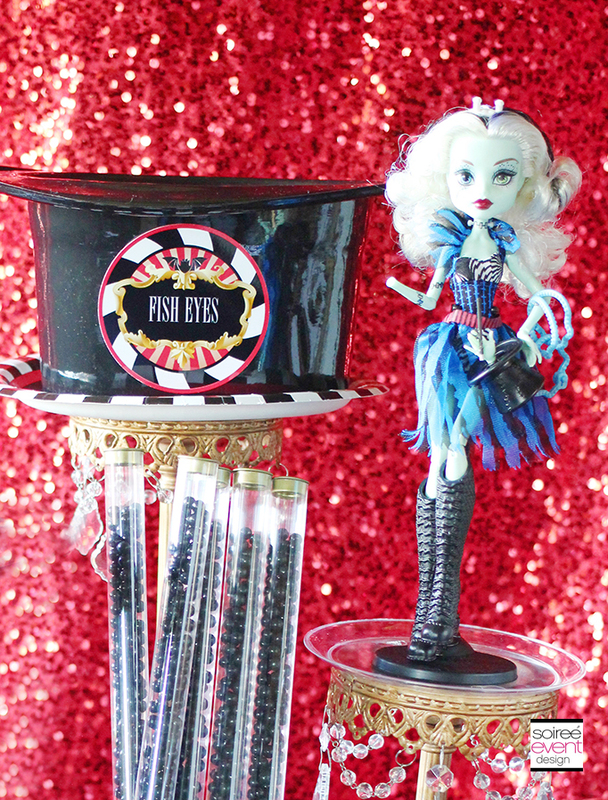 GIRLFRIEND TIP: For an easy trick, turn a black and white striped paper cup upside down and you have the perfect circus platform to display your newest Monster High Freak du Chic dolls! Next, look for gold items that work with the circus theme like this gold elephant, gold round trays (that I used to create a 3-ring circus) and these fabulous gold dessert trays that I stacked on top of each other to create a grand entrance for Gooliope. 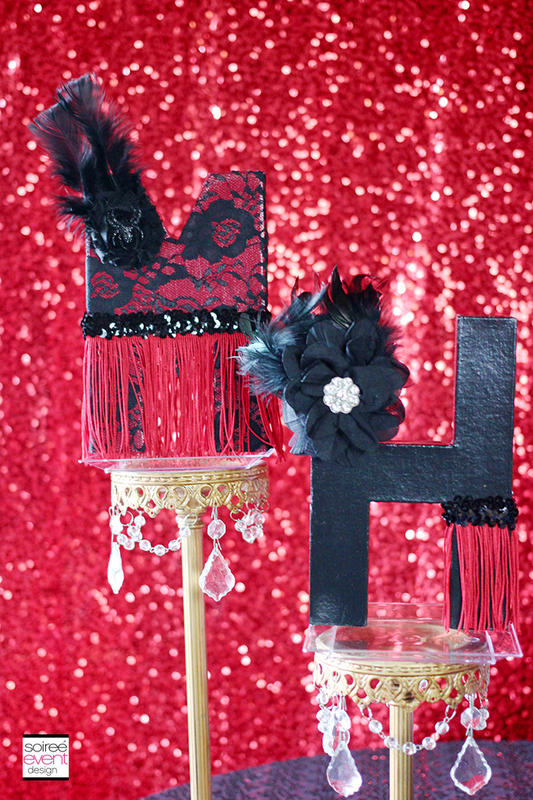 Add in unique custom decor pieces like these custom “M & H” decorated letters to match the Freak du Chic style and you are all set! GIRLFRIEND TIP: Think outside the box when looking for decor to decorate your party space! 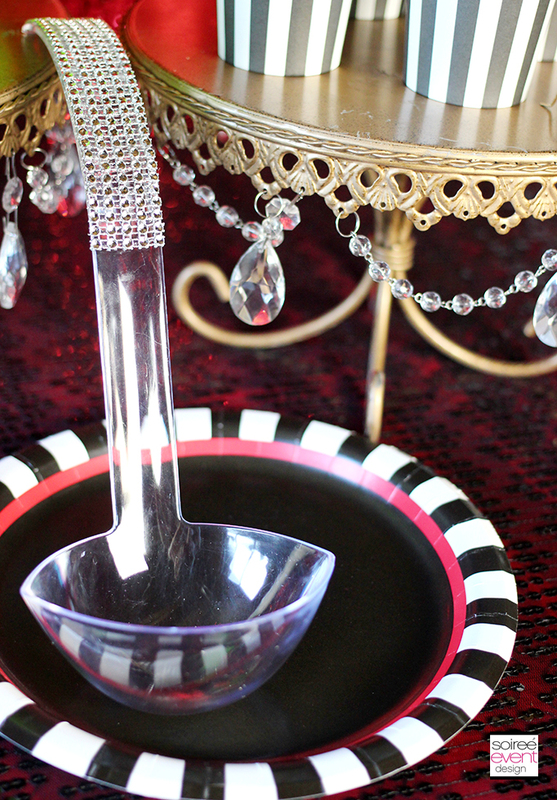 I created a three-ring circus by using 3 gold mirrored trays I found in Home Goods. Totally unexpected but totally freaky fab! 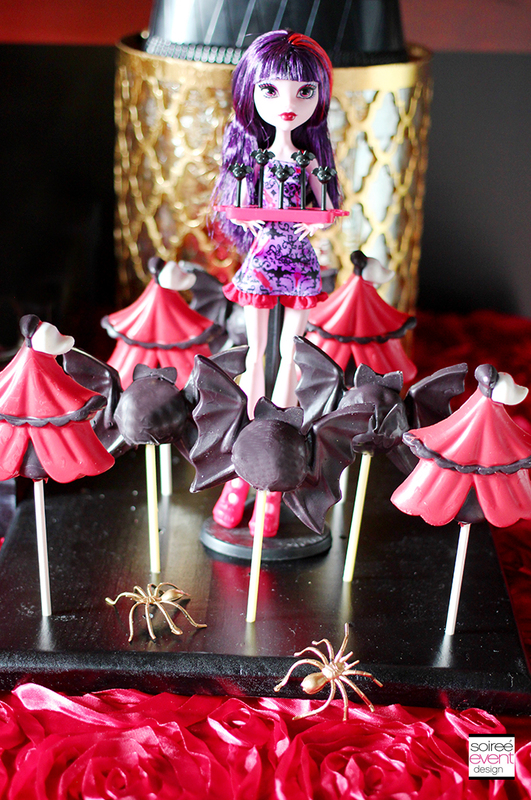 AND…instead of just saving the mini poster cards that come with each doll, display them in the party decor like I did here with Frankie’s card. 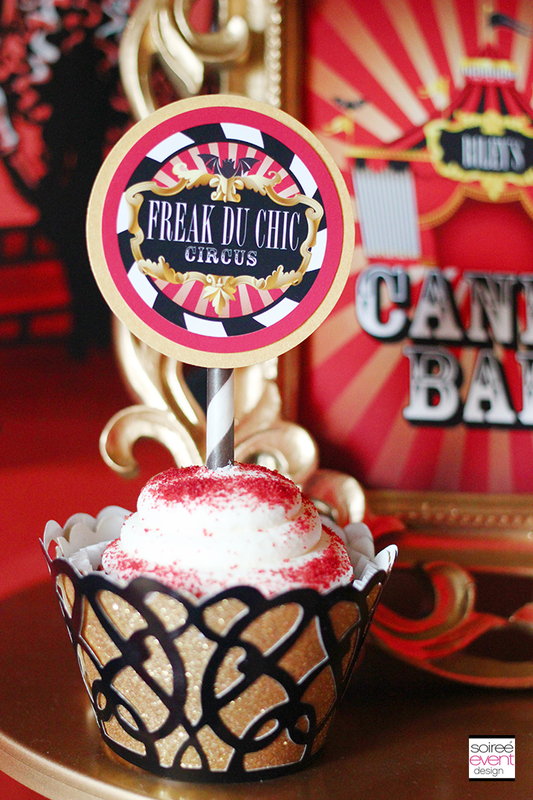 CREATE A BIG TOP FREAK DU CHIC SWEETS BAR! 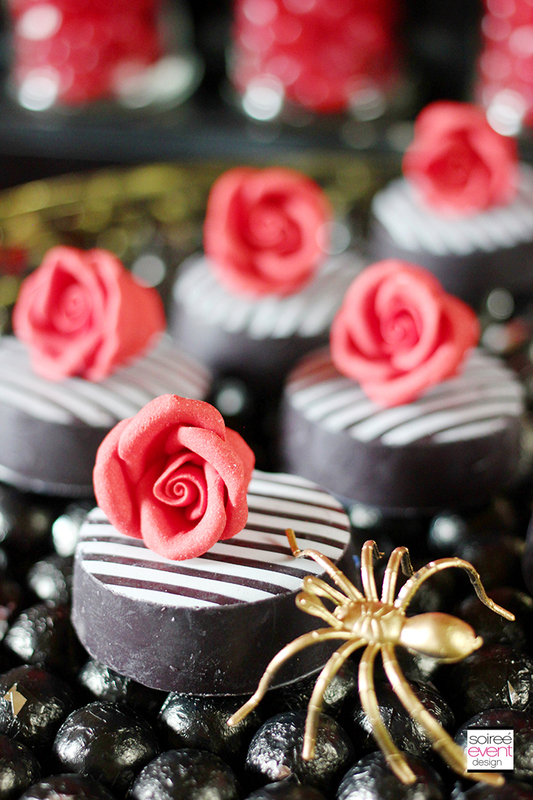 Sweets Bars are a a staple at all of my parties and this one was no exception! 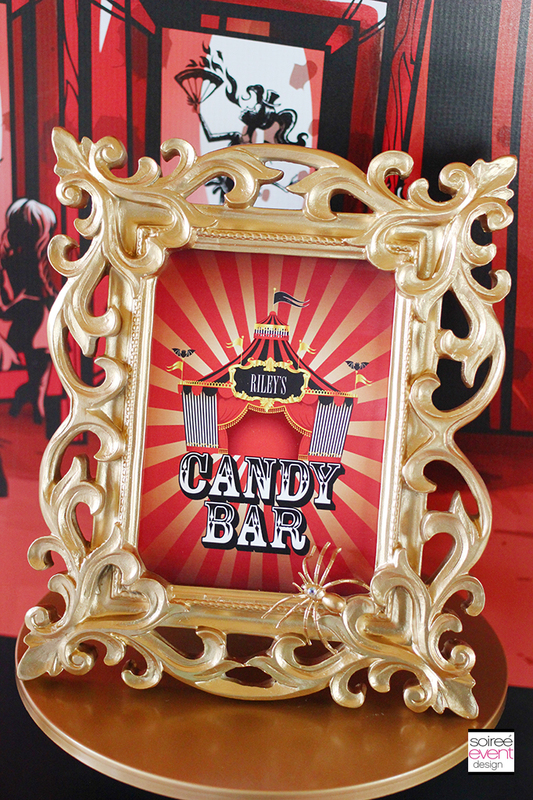 For me, designing a Sweets Bar starts with the backdrop! Since I’m working with Mattel I was able to use this AMAZING custom backdrop which really set the scene and provided an amazing wow factor to the party space. 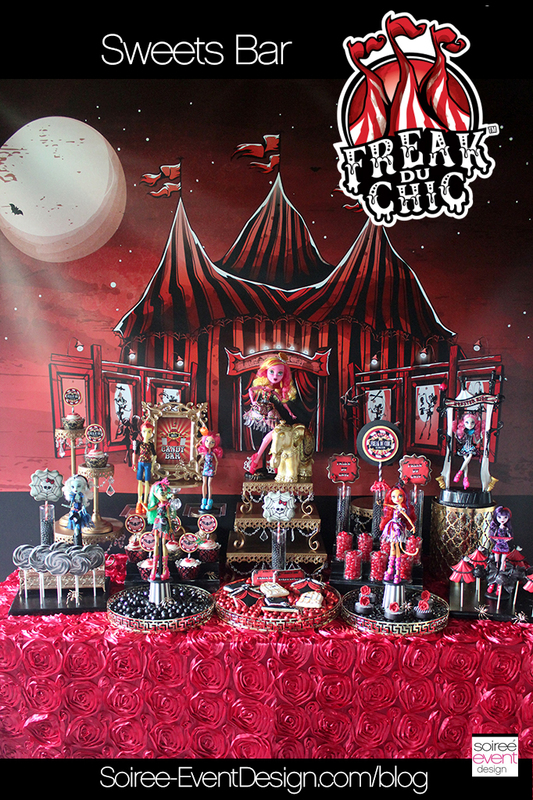 This fabulous Freak du Chic Sweets Bar is complete with bat cake pops, big top chocolate lollipops, iced cookies, cupcakes and of course a mini strawberry jam jelly bean bar inspired by Gooliope Jellington! 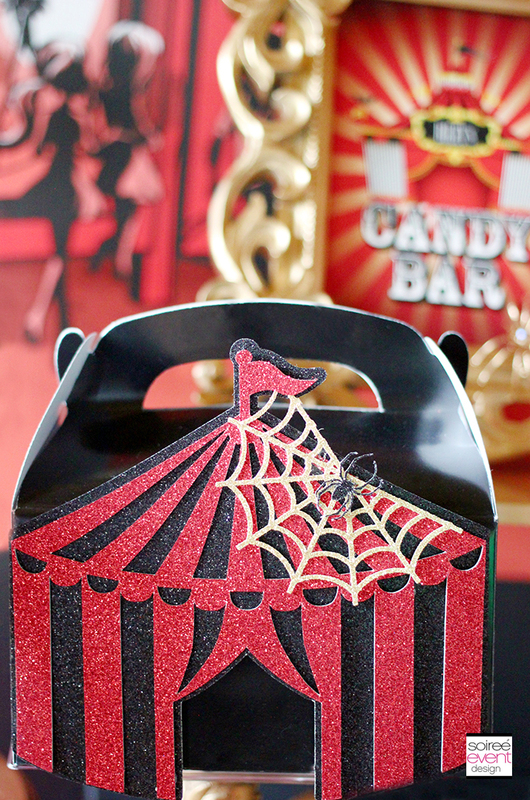 Be sure to set out these amazing big top treat boxes for your guests to fill with yummy sweets to take home. 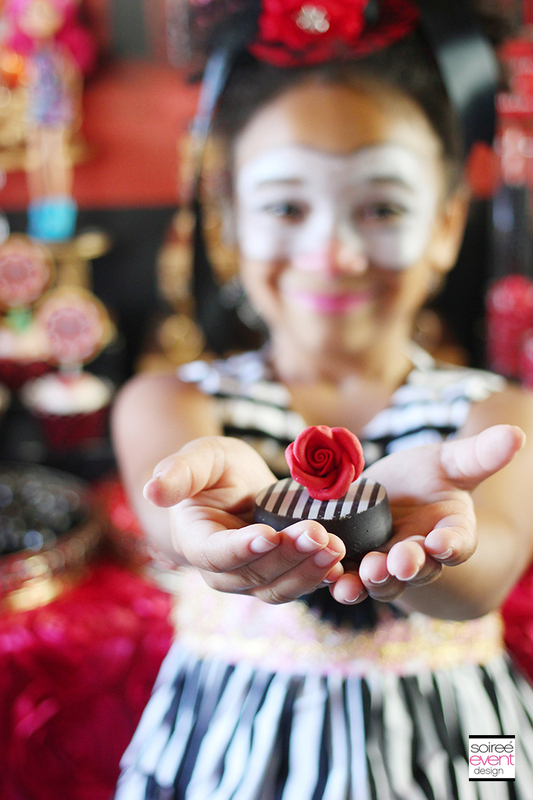 GIRLFRIEND TIP: Use printables to add a personalized touch to your candy table! 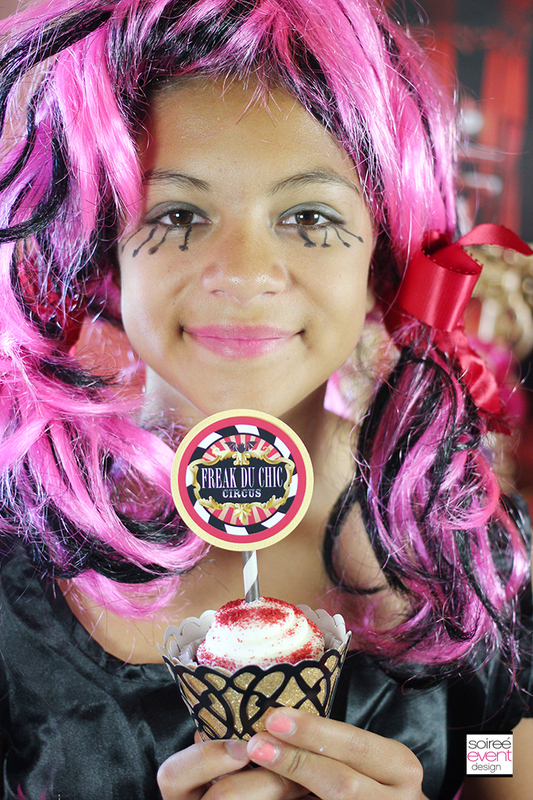 Here I used our newest “Freaky Circus” printable collection (available in my shop here) to jazz up store-bought cupcakes with printable cupcake toppers and branded the table with this amazing table sign and Lolli-tags™! 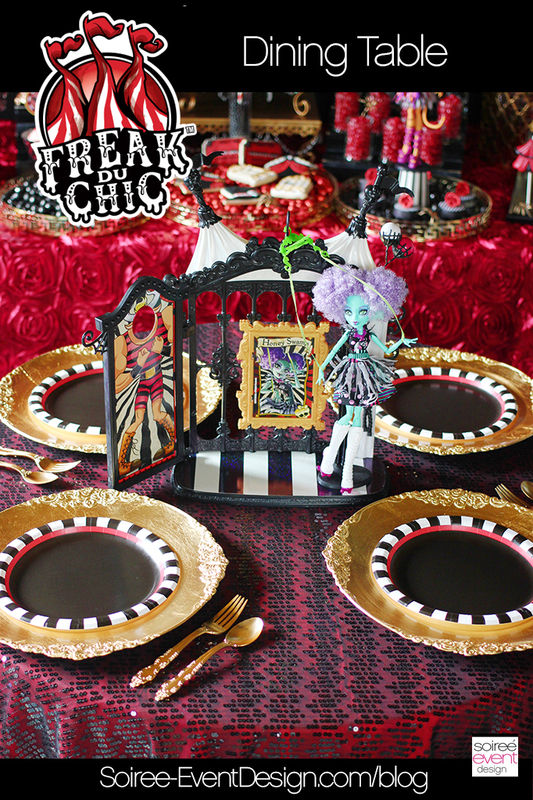 USE THE FREAK DU CHIC PLAYSET AS A DINING TABLE CENTERPIECE! The wow factor of any dining table is the centerpiece and man, oh man…this one is scary cool! 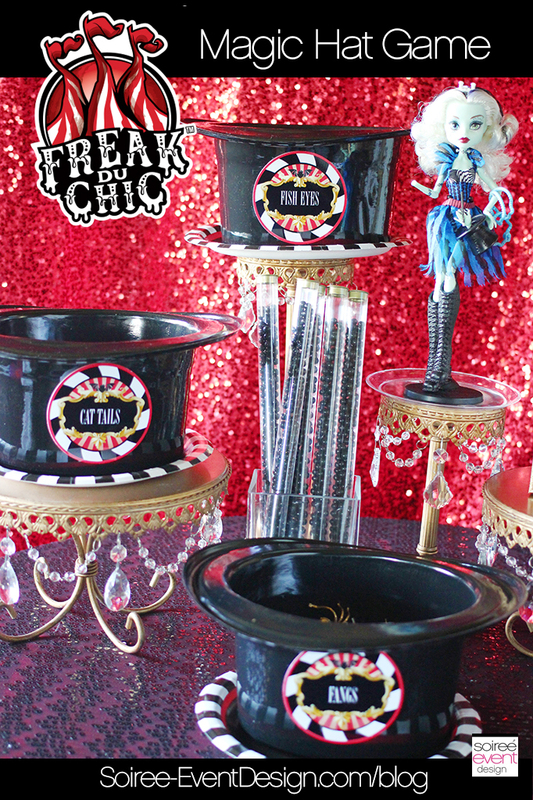 Place your Freak du Chic playset in the center of the dining table for an easy centerpiece idea. 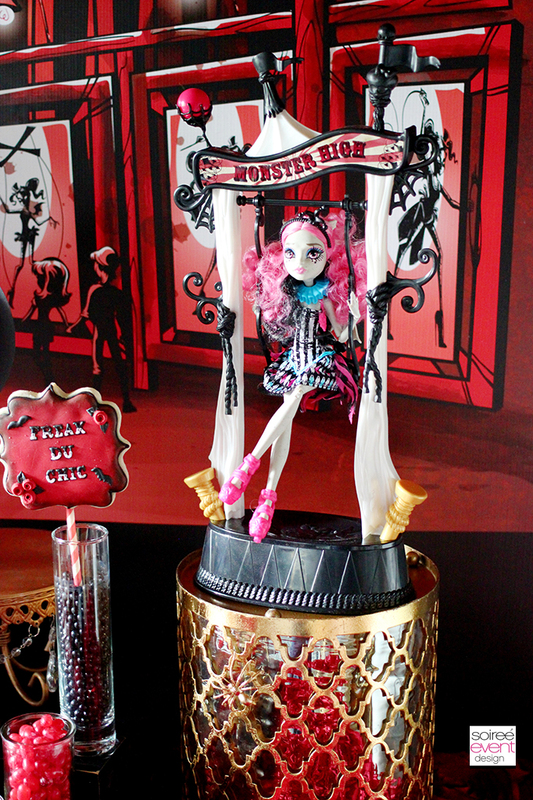 Be sure to display your favorite Monster High Freak du Chic ghoul on the playset. My daughter’s favorite is Honey Swamp so I simply swapped out the poster in the playset frame with the one that came with Honey Swamp and displayed her on the dining table. 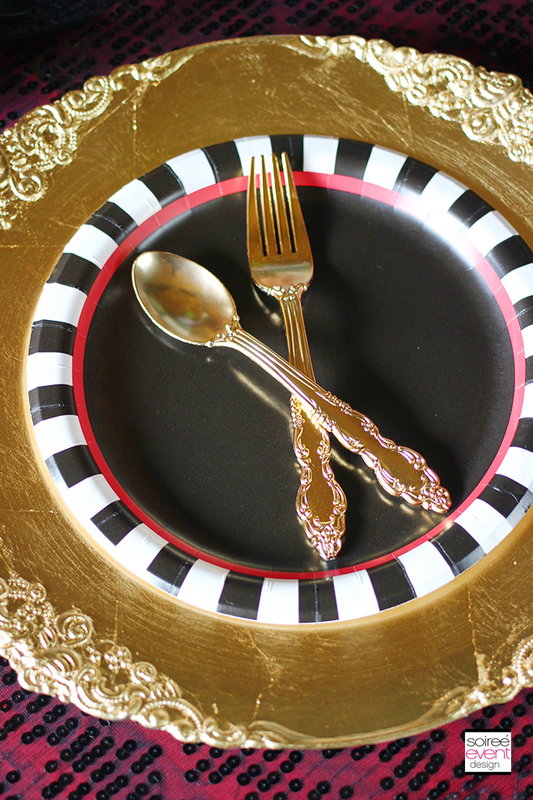 Finish off the table design by placing matching black and white striped plates on top of these vintage gold chargers and gold plastic silverware. GOLD PLASTIC SILVERWARE!!! I KNOW…how AMAZING are these! GIRLFRIEND TIP: All of the Freak Du Chic dolls come with their own poster so you can display your favorite on the dining table as well by swapping out the poster. 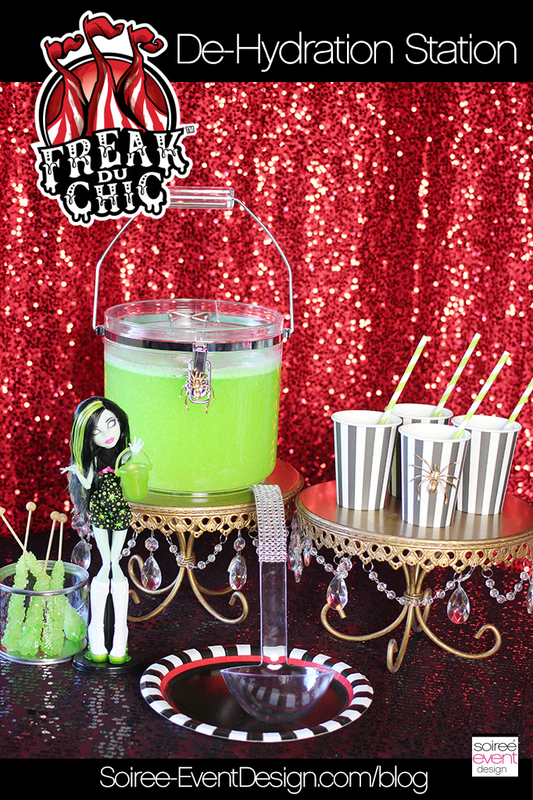 Now you’re ready to eat yummy cupcakes and sweet treats, but WAIT…don’t forget to have your guests visit Scarah Screams’ De-Hydration Station to fill their cups full of her lemon-lime “car wash water”..I mean my signature lemon-lime sorbet punch! 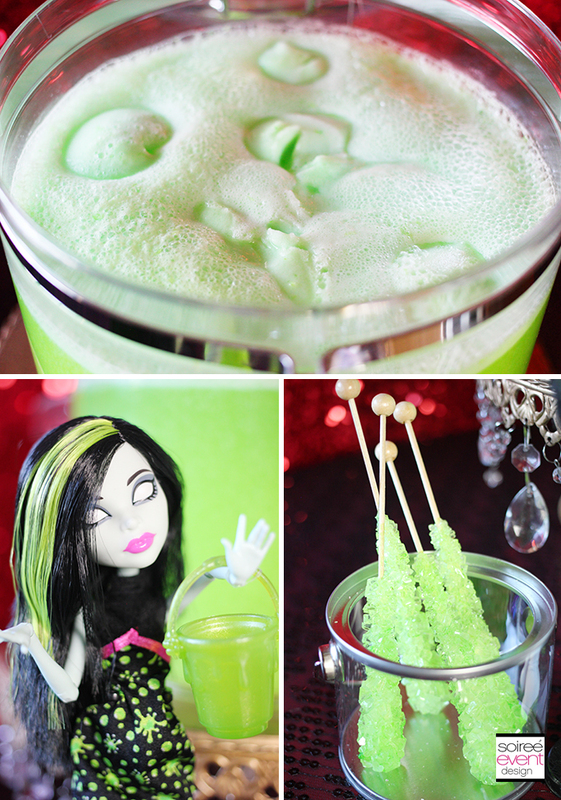 – Finish it off with a sparkly lemon/lime rock candy stick stirrer…YUMMY! GIRLFRIEND TIP: While the girls are eating this is a great time to play all three of the Freak Du Chic webisodes. If you have a smart TV, this is super easy…just pull up the webisodes on Monster High’s YouTube Channel and you’re good to go. PLAY FRANKIE STEIN’S MAGIC HAT CHALLENGE! 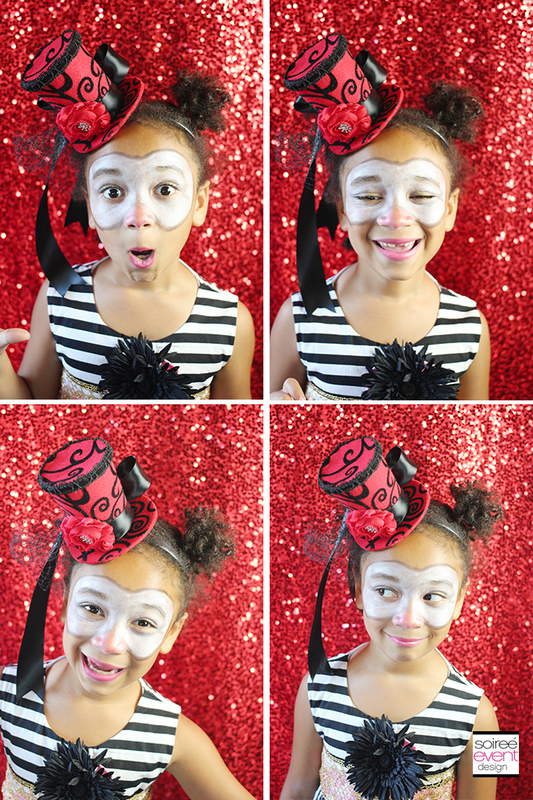 For a fun freaky game, have your guests take Frankie’s Magic Hat Challenge! 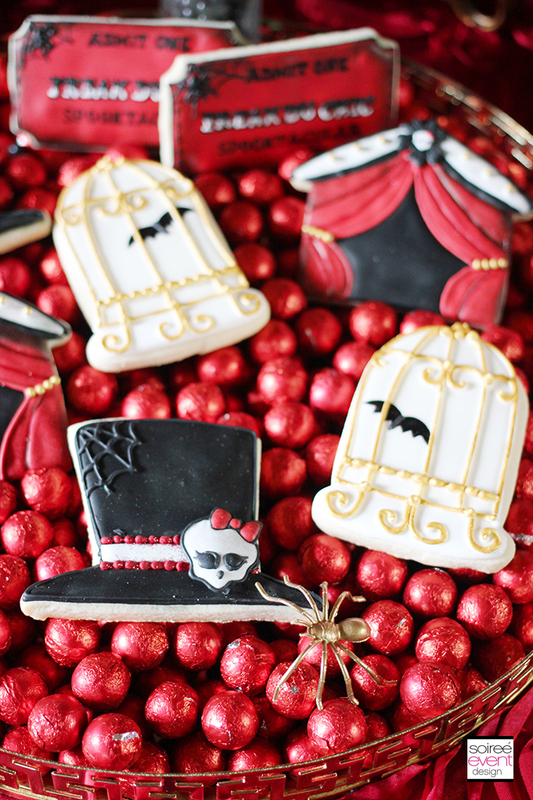 For this, you’ll three large black plastic top hats and label each one with Cat Tails, Fish Eyes and Fangs! Then fill each hat with items that feel like those items. I used furry chenille stems for Cat Tails, frozen grapes for Fish Eyes and plastic spiders for Fangs. The challenge is to have each guest put their hands inside and feel the creepy items inside. 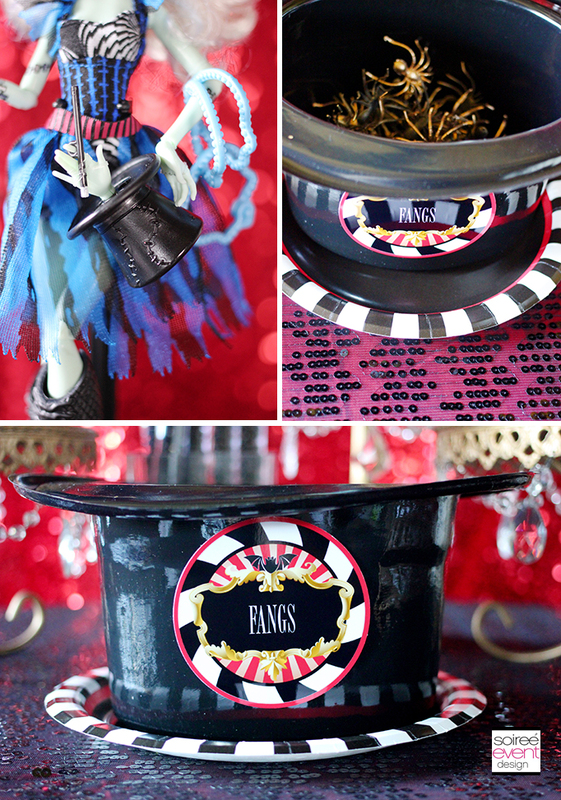 If they are brave enough to complete Frankie’s Magic Hat Challenge, each guest wins a candy filled magic wand and a bag full of Monster High favors to take home. GIRLFRIEND TIP: For a magical twist, mix up the tags so that the fish eyes are on the hat filled with furry cat tails so they are surprised when they put their hands inside Frankie’s magic hat. 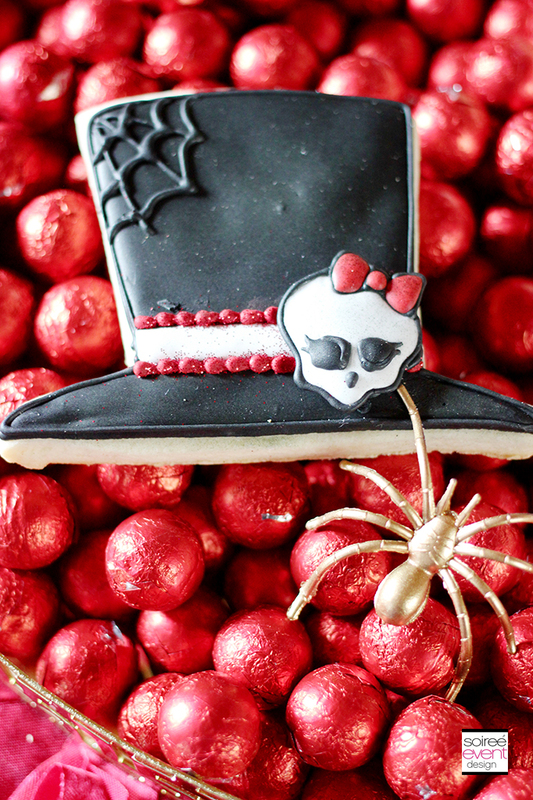 SEND YOUR GUESTS HOME WITH SPOOK-TACULAR PARTY FAVORS! 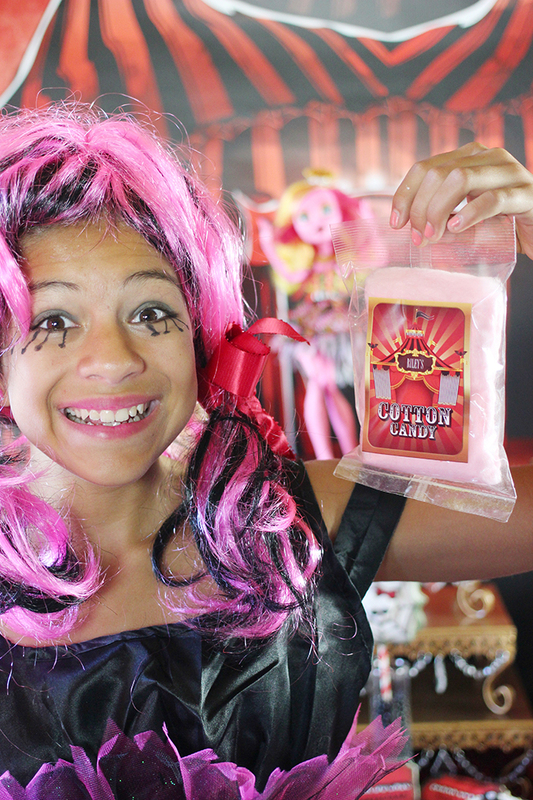 What’s a circus without cotton candy! 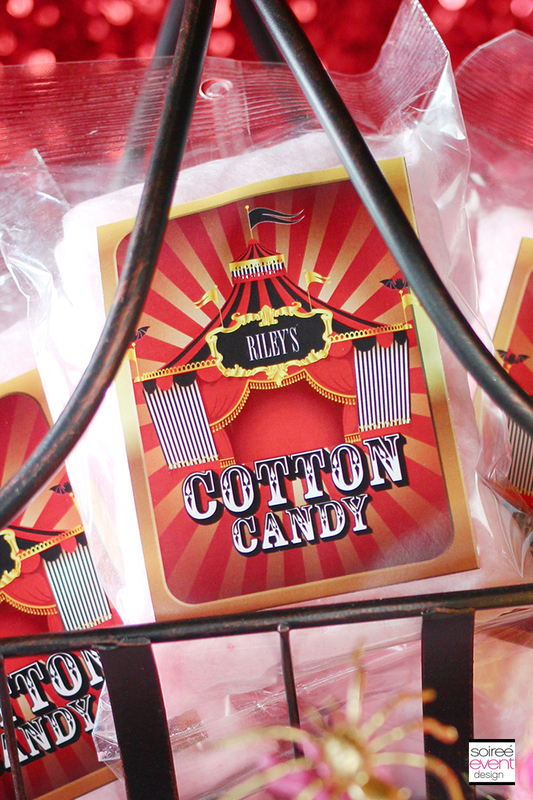 Not just any cotton candy….how about these awesome custom labeled cotton candy bags personalized with your name! Now that’s Freak du Chic! 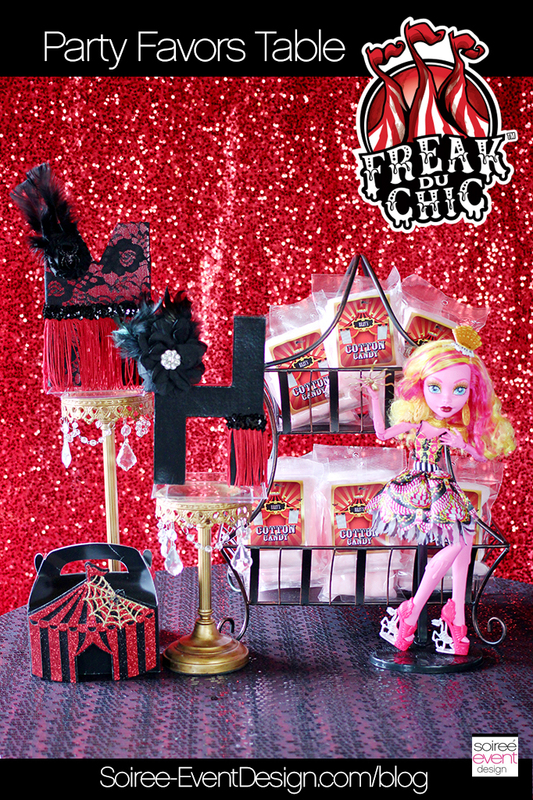 ENTER TO WIN A MONSTER HIGH FREAK DU CHIC PARTY PACK! Scroll down to the end of the post to ENTER TO WIN on the Rafflecopter! Giveaway ends on Monday August 17th. Winners will be announced here on this blog post on Tuesday, August 18th. U.S. entries only. Winner will be contacted via email on 8/18 and must respond within 24 hours to claim their prize. Be sure to complete all the mandatory entry requirements. If you are chosen the winner and you have not completed all the entry requirements, you will be disqualified and another winner randomly chosen. GOOD LUCK! NO PURCHASE NECESSARY. PURCHASE WILL NOT IMPROVE CHANCES OF WINNING. MANY WILL ENTER, ONE WILL WIN. Participants may enter the giveaway between August 3, 2015 12:01 AM CST and August 17, 2015 11:59 PM CST by going online to https://soiree-eventdesign.com/blog/and completing the online entry form with name and email address. NOTE: if online entry participants are 18 years of age or less, they must provide their parent’s or legal guardian’s email address so that Soiree Event Design can send an email to the parent or legal guardian advising them of the participant’s attempt to enter the giveaway. Limit 1 full entry per email address. Giveaway is open to legal residents of the continental U.S. who are 18 years of age at time of entry. Void in Puerto Rico, U.S. territories and possessions. 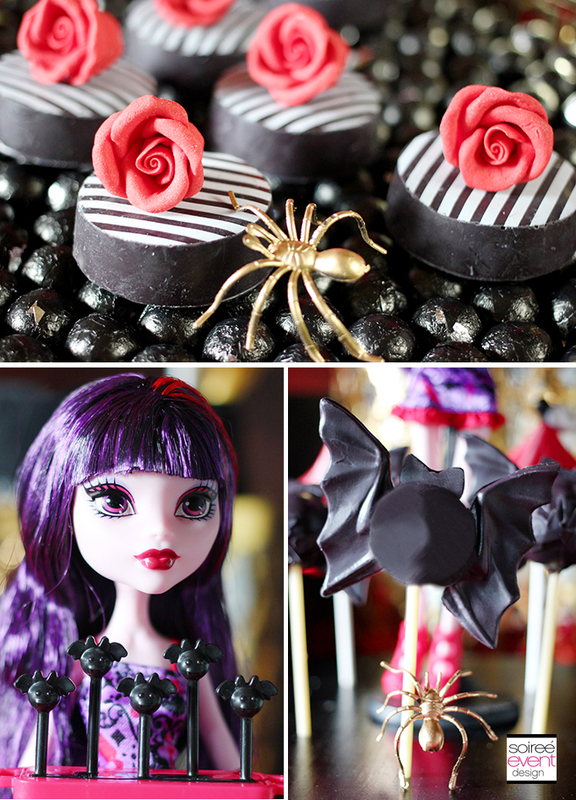 WANT MORE MONSTER HIGH PARTY INSPIRATION? 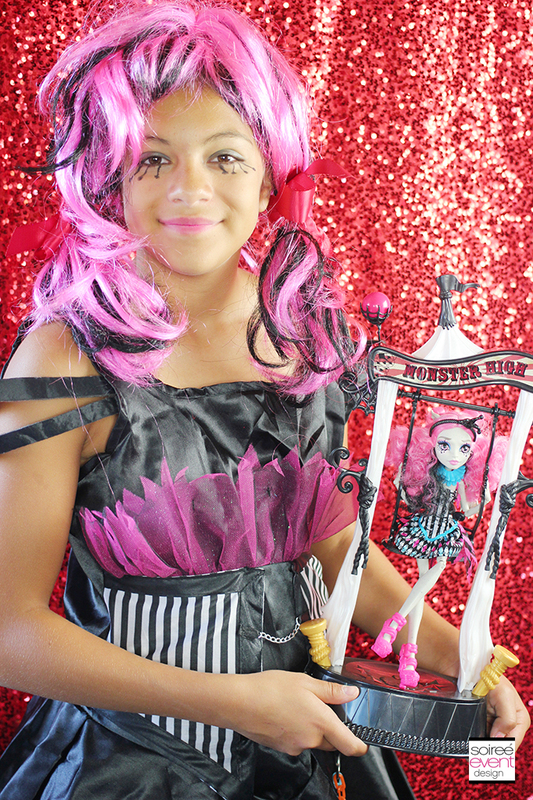 CLICK HERE to check out my Monster High Freak Du Chic Pinterest board for a virtual shopping list of most of the items I used in this party’s design along with prices and links to purchase them. 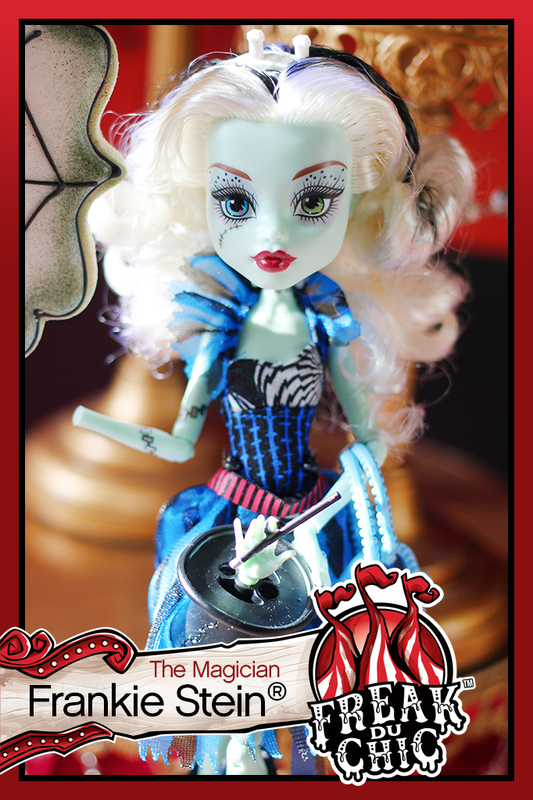 My favorite Freak du Chic doll has got to be Gulliope Jellington. I love everything about her! What girl wouldn’t love that? It sounds like an awesome party idea! 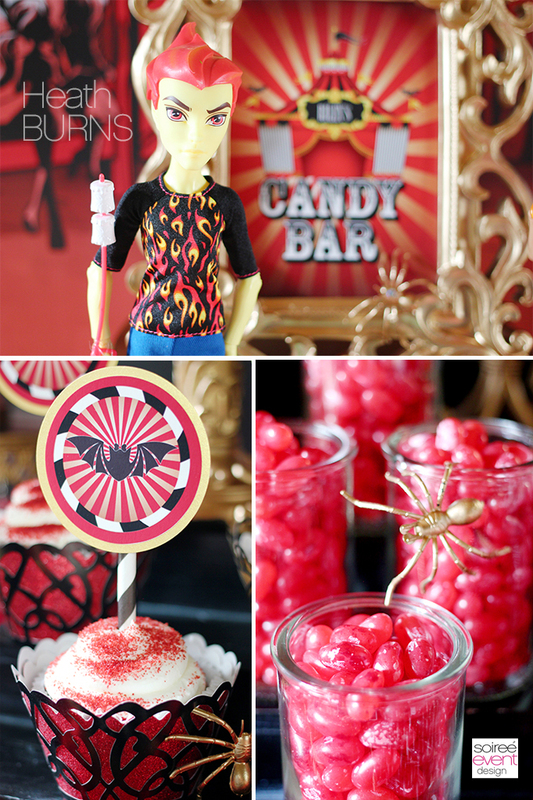 LOVE LOVE LOVE every detail of this party! The colors are amazing and those treat boxes are so adorable! OMGosh this party is FABULOUS!!!!!!!!!! 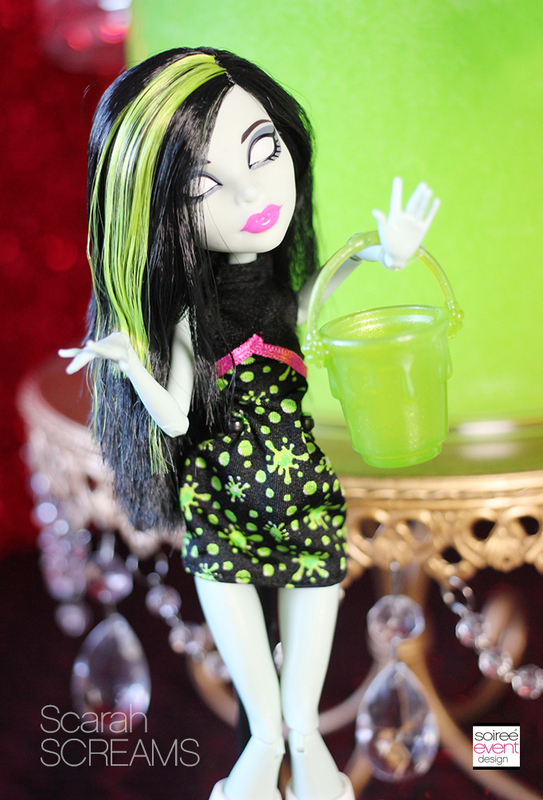 I had to laugh at Monster Highs New Goulfriend… it is Goulfriend that made me chuckle. Cute! So cool. I want to be a kid again so I can play! Those photos are AMAZING. I love the girls and the dolls. 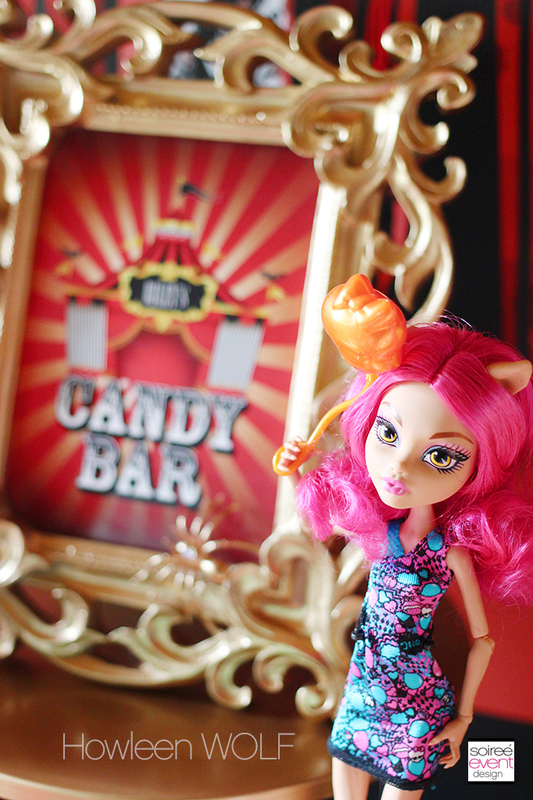 And the candy bar! This would be an amazing party to have. WOW! This is sooo amazing! Such a beautiful set up and every photo is gorgeous. 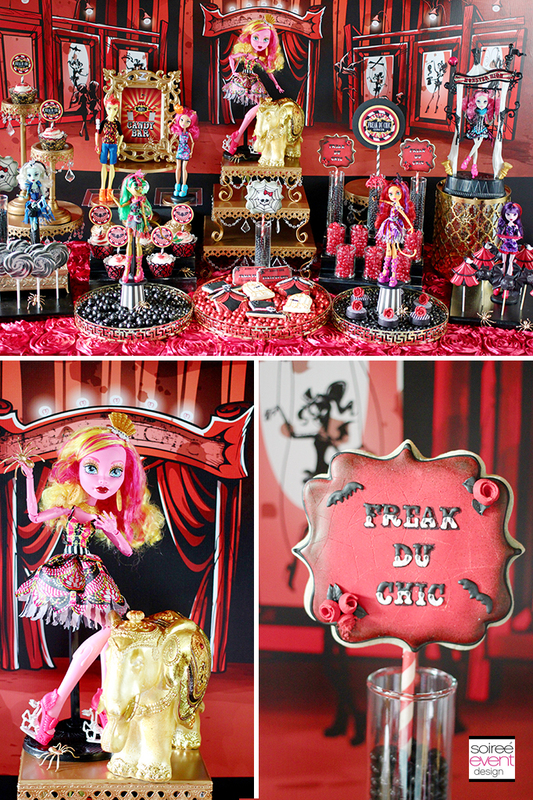 I am in love with Freak du Chic! My favorite doll is Rochelle! 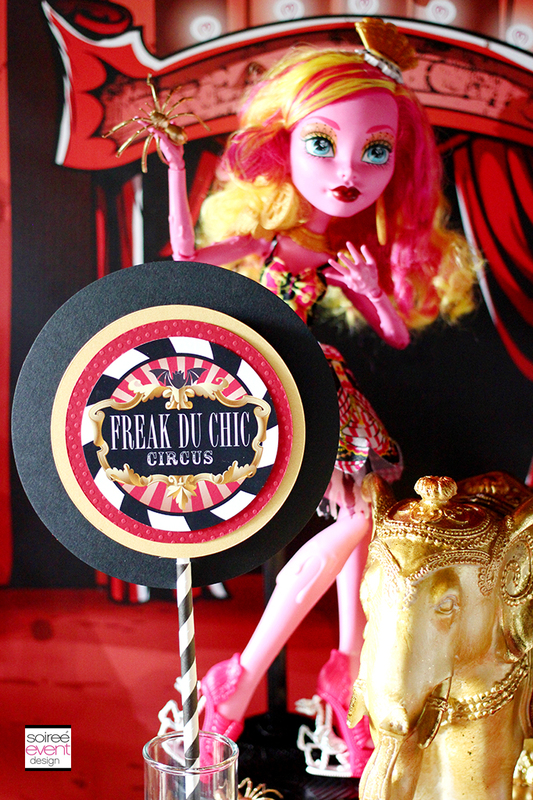 I can’t wait to get The Freak du Chic playset with her, she’s so sweet. I also love Gooliope she’s just awesome. What a cool party. you are so creative and fun. 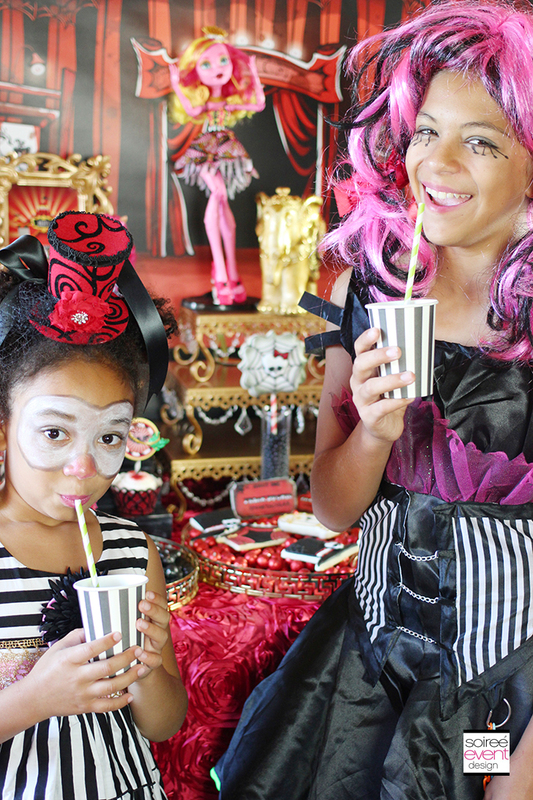 You always have the coolest ideas for parties!! 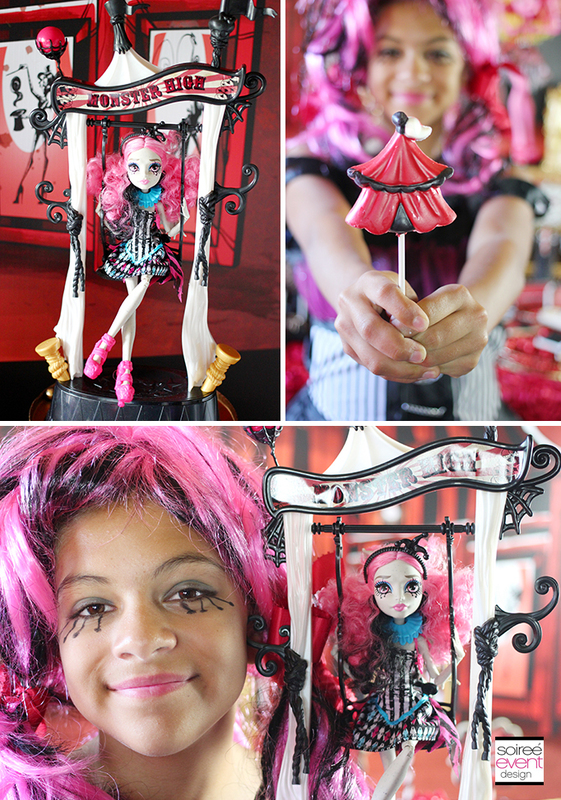 My girls are just starting to get into Monster High so these ideas would be perfect! This is absolutely amazing. The backdrop is awesome. The kids always model perfectly and are so into it. I love the whole thing. Great job!!! Now that is a spectacular party. Love all the decor. Looks like a fun event! Your parties are so unique! I love all the goodies you made! My favorite ghoul from Freak Du Chic would definitely have to be Rochelle! She is so beautiful and her makeup is gorgeous! I really love this party! My favorite so far!! This is a fantastic idea and your photos depicting the party and the girls in it are amazing. I may want to do this for my 42nd birthday. Is that allowed?? Love this party! Just bought this doll for my daughter. She’s huge! Wow, Tonya – I would have love this as a little girl – and you own little one, )or is there more than one model?) 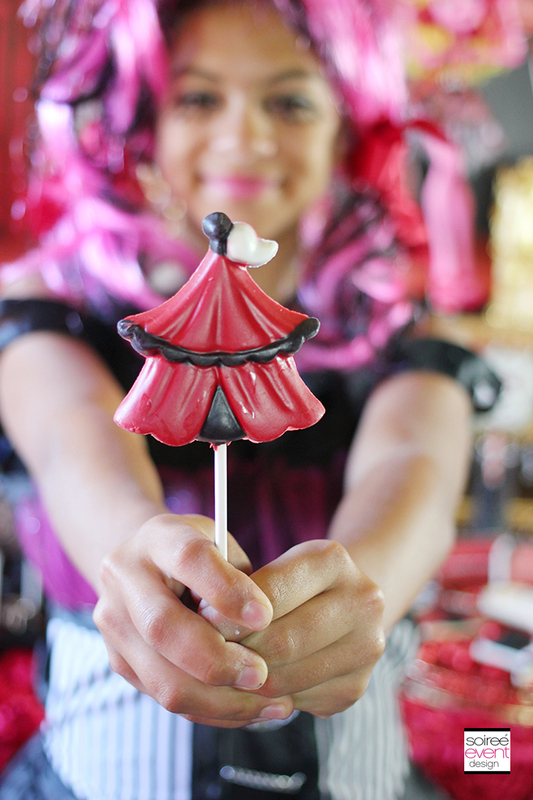 is a beautiful little model of some fun and creative party outfits! Those are the best treats ever! This is such an awesome theme. 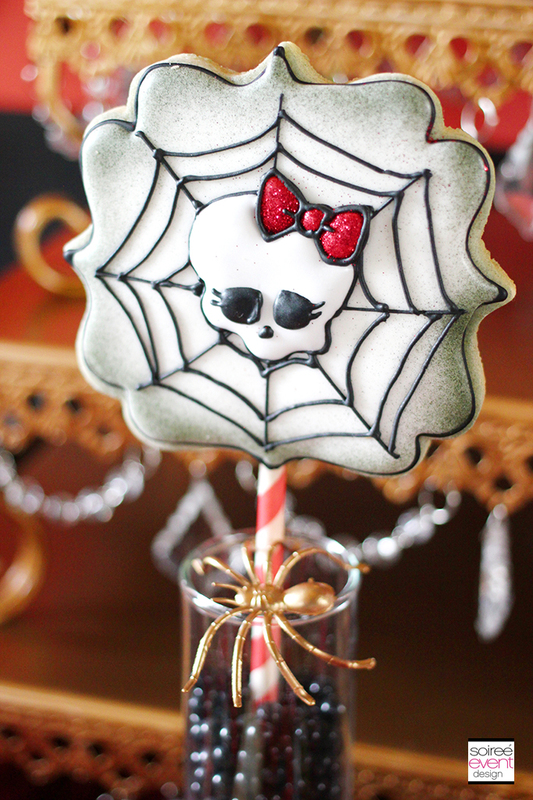 That drink is definitely spooktacular! Such a fun theme. 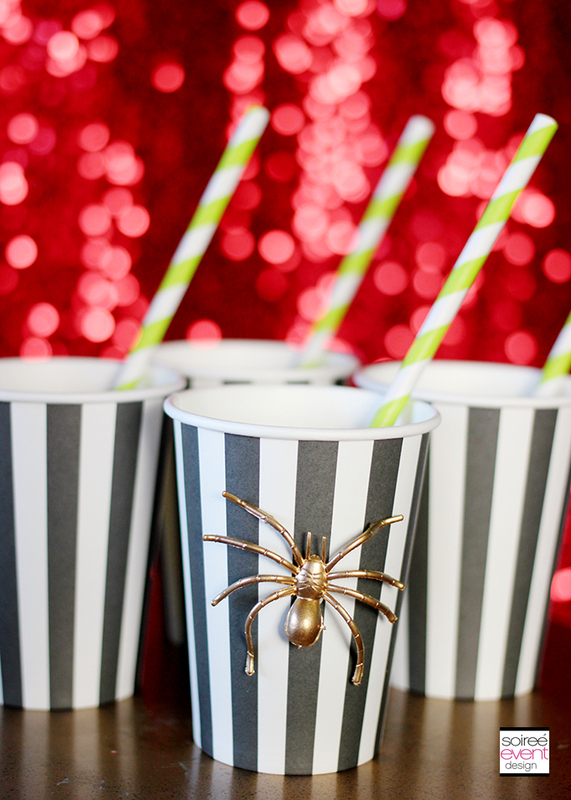 You’ve definitely found your knack with party planning too. 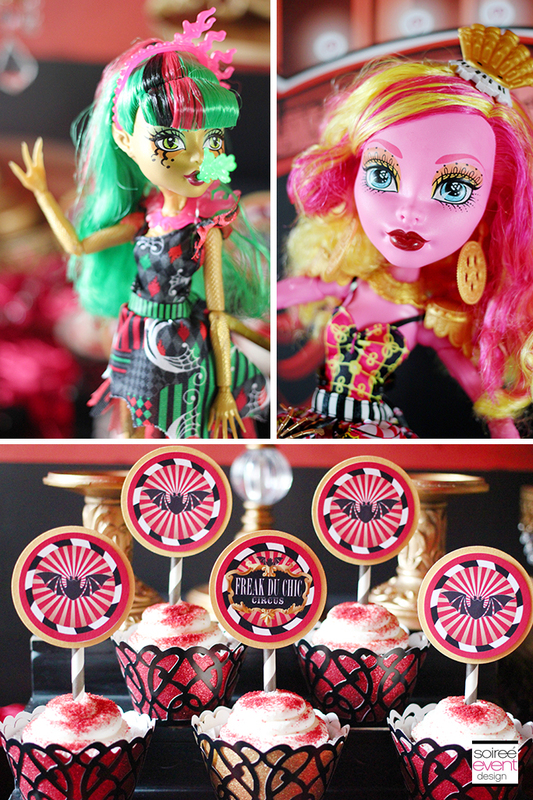 Looks like a great party for any Monster High fan! A wonderful giveaway as well! You have so found a calling here with all this delicious creativity. I get inspired by your posts! This looks like a lot of fun. 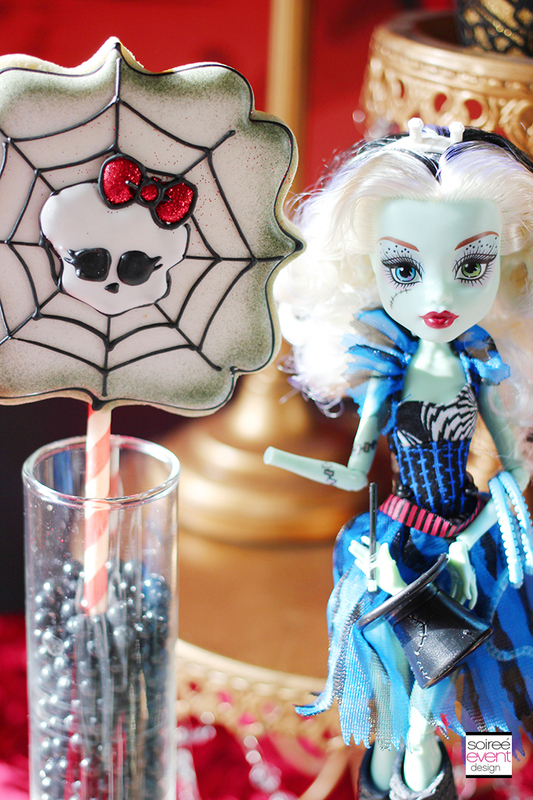 I know a lot of kids that love Monster High! What an amazing party. 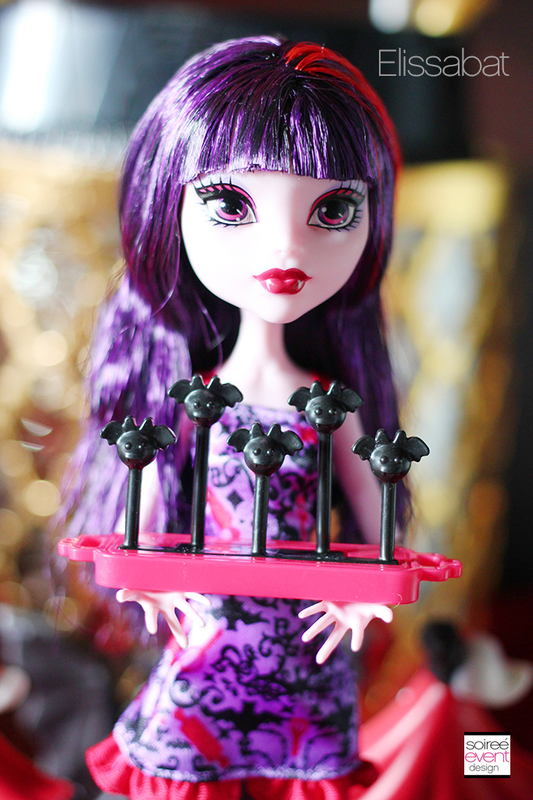 My daughter isn’t into Monster High as yet but this is certainly something I would think of when the time comes. This is a fantastic party!!! 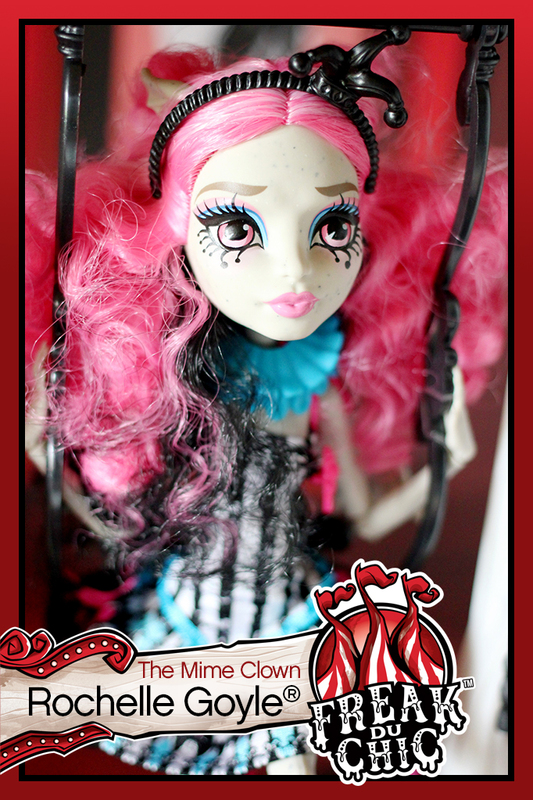 My favorite doll has to be Honey, I love her Marionette details and the hair, of course! 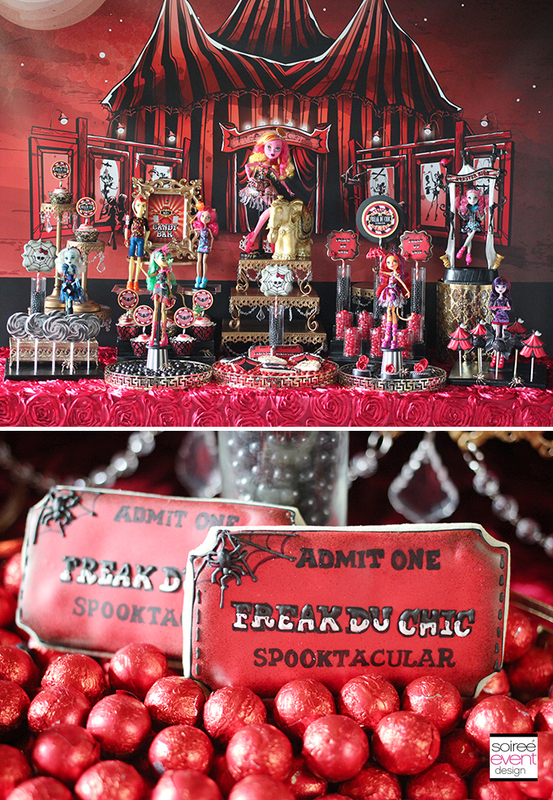 No one on here would love this more than my 2 ghouls, over 250 dolls and cannot wait for the freak du chic dolls to hit locally! Plus we have a birthday coming up in October on Halloween! We love our ghouls & mansters! Thanks for the chance Tonya! Our fav has to be the new yet ever agile Toralei!!! 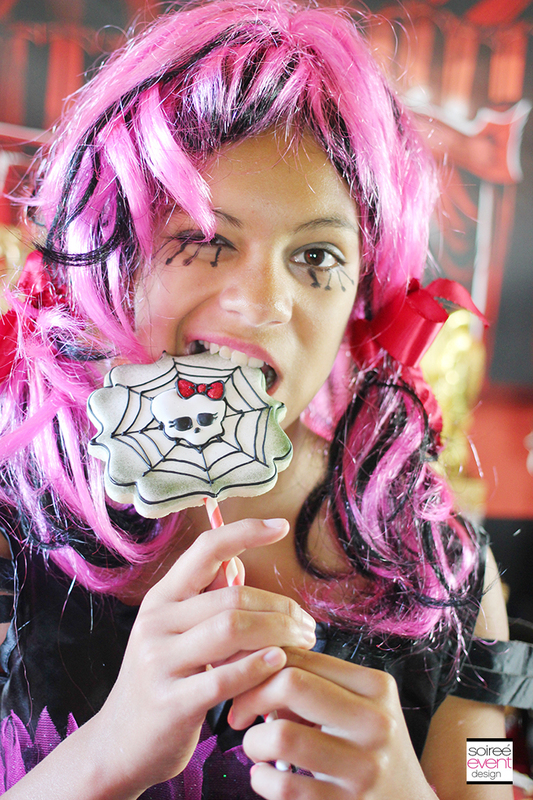 Looks like you had a wonderful monster high party!!! They’re all fab!! Honey Swamp sure is a cute one!! 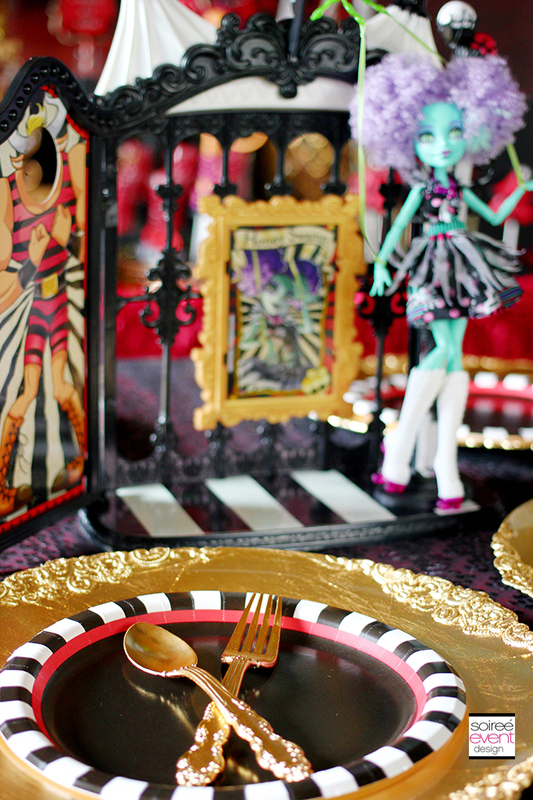 My girls love monster high and this would be an awesome party. This is amazing. My girls would absolutely go nuts for a party like this. They love monster high. I love this theme! So colorful and bold! 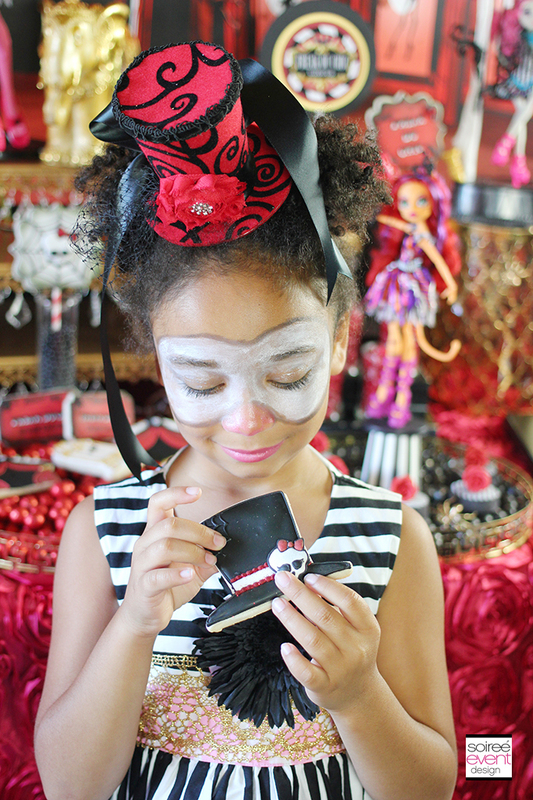 Who doesn’t love Monster High! I want to be a kid again! Your party posts are always INCREDIBLE! Any little girl would be lucky to have a party like this. I love all of the dolls! So awesome. Your parties are as gore-gous as always!! I’d be almost afraid to let the kids touch anything because it’s so beautiful! 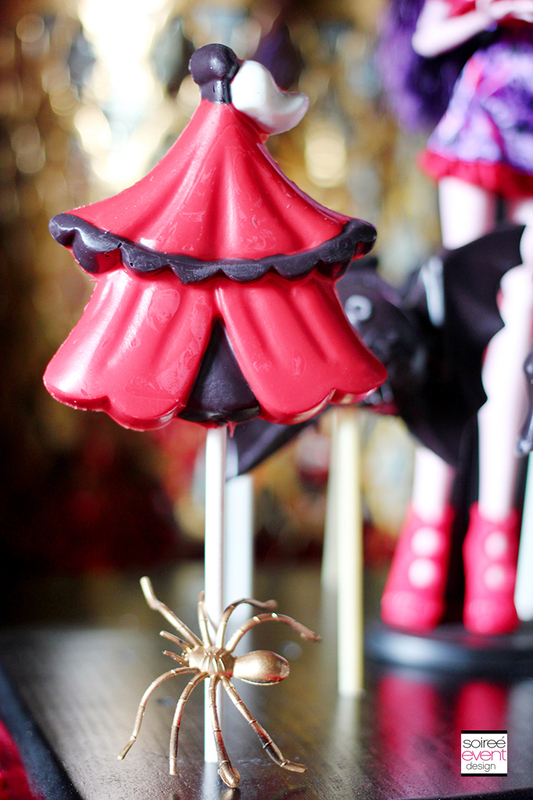 Now I need to go and hunt down my own sweets after drooling over the sweets bar. 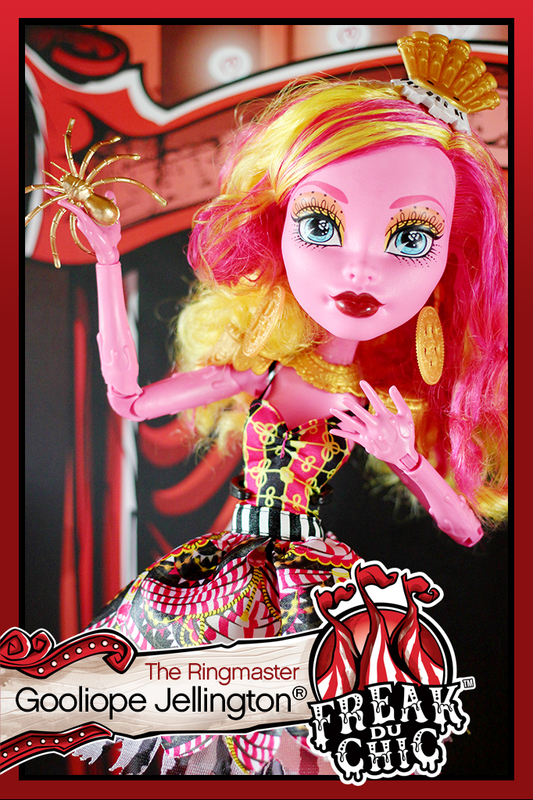 To answer the Rafflecopter question, though, my favorite Freak du Chic doll has got to be a tie between Jinafire Long and Toralei. They’re simply gore-gous in their new attire and their roles are so clever! Thank you so much for hosting a giveaway- I’m sure the winner will be ecstatic! I like them all but love Rochelle Goyle! 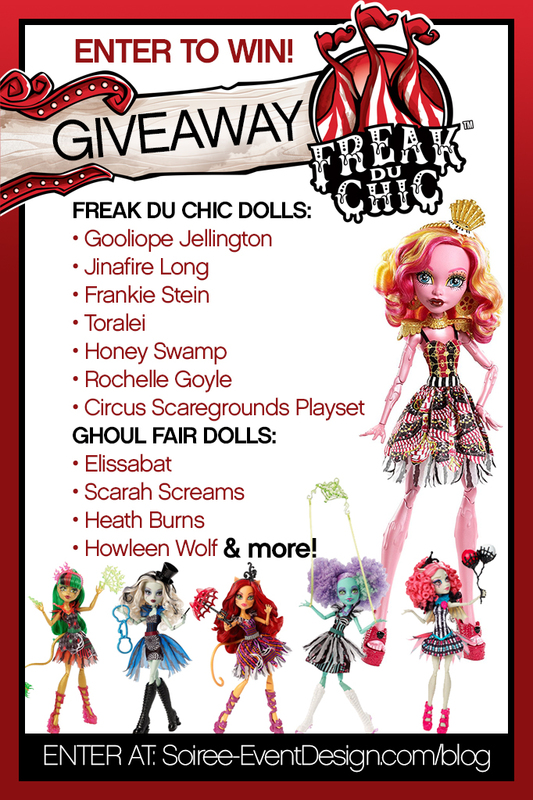 I am torn between the Freak du Chic Frankie Stein Doll and the Freak du Chic Rochell Goyle Doll. I have to say, I think I am a little jealous, where were these dolls when I was growing up? I loved watching the Addams Family and the Muensters and these would have been the coolest! Probably a hard tie between Rochelle and Honey Swamp. Gotta love that fluffy hair! 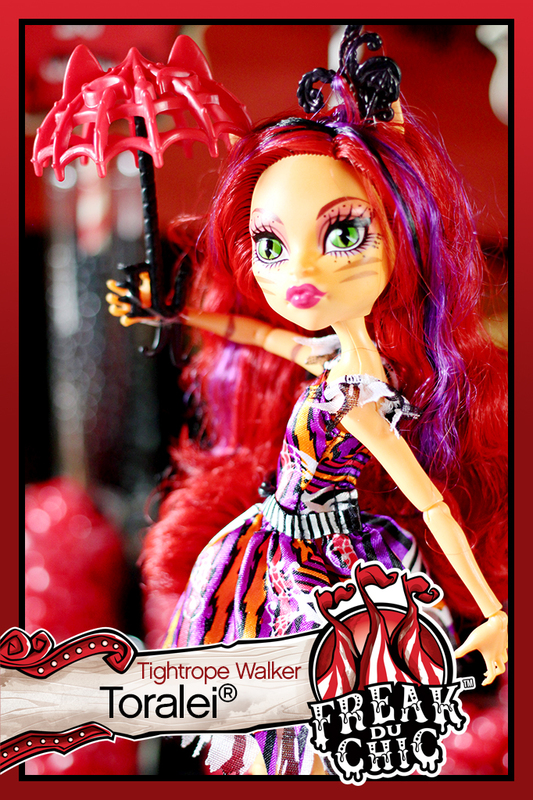 I love all of these dolls and my niece is gaga over them I really like Scarah Dreaams. I like her colors! They are all so different and so fun! IN LOVE with this! My favoruite is Elissabat, I adore her! Great work. 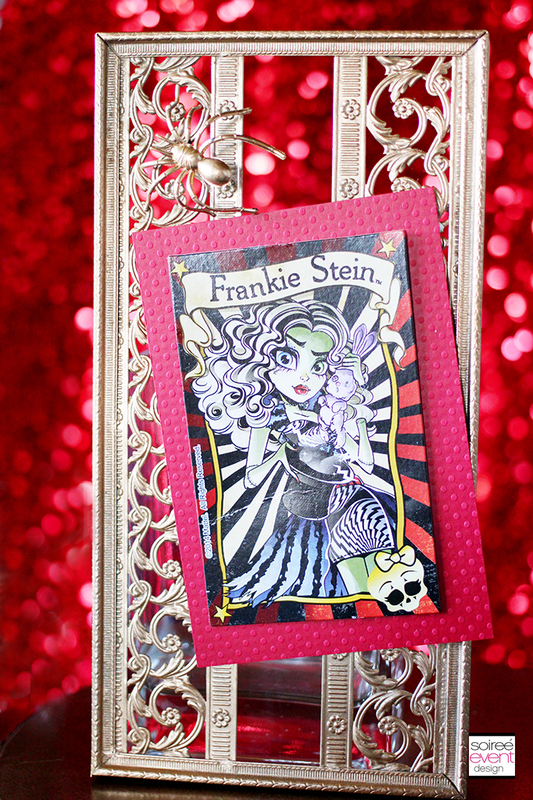 My favorite Freak Du Chic doll is Frankie Stein. 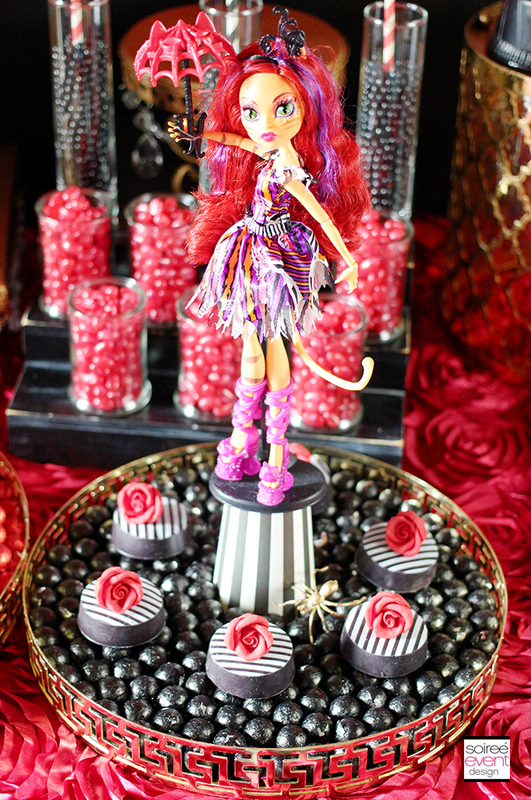 Her ringleader outfit is to die for! My favorite has to be Garanieestein so cute and I adre her outfit. Who wouldnt llike her? 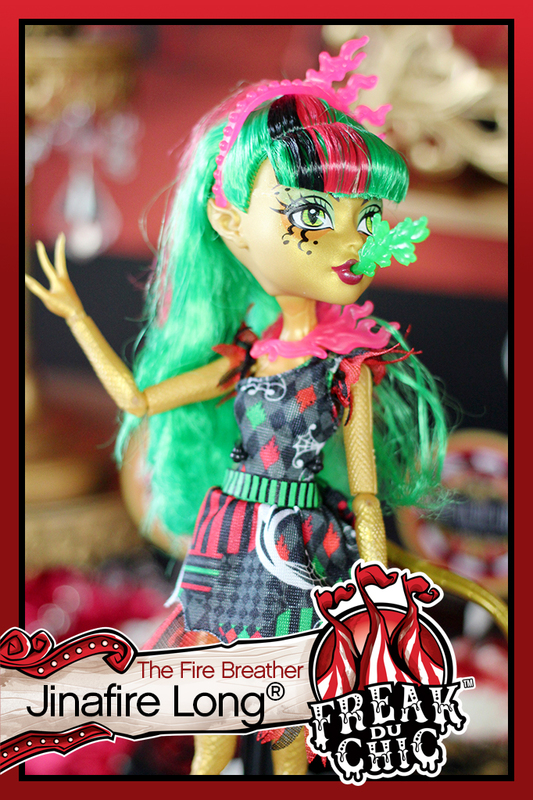 I love the Freak du Chic Rochell Goyle Doll. What an awesome giveaway! Thanks for the chance! Frankie Stein is such a cutie! I’d adore to get all this stuff for my daughter and I to have fun with!